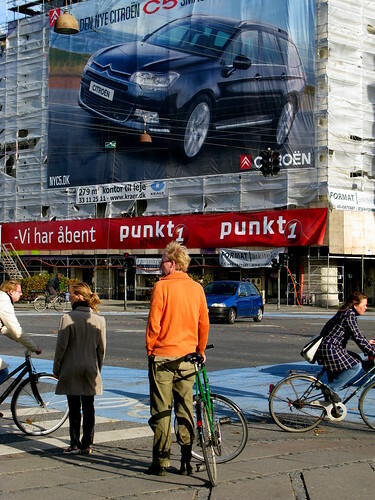 Citröen advert in Copenhagen last year. Continuing on the Copenhagenize theme of how the car industry is rallying to counter the [re]boom of the bicycle as transport in our cities, here's a new angle from the French car giant Citröen. Last week they filmed a car advert here in Copenhagen, for their new 2011 C4 model which, by all accounts will save the planet, plug the hole in the Gulf of Mexico and play with your puppies like a loving uncle with one hand whilst sowing organic beetroot seeds with the other. The Citröen advert, however, will present a point of view that differs from the recent Car Industry Strikes Back efforts we've seen of late. From Audi, Mercedes Benz, Volkswagon, etc. Not to mention FIAT and Volvo continuing the car industry tradition of desperately trying to promote bicycle helmets in order to make bicycles look more dangerous than they are. An earlier Audi advert attempted a similar angle, but Citröen seems to have shrugged and decided to show off their new four-wheeled environmental jewel in a whole new light. With a budget the size of a medium-sized Danish feature film, they were allowed to have their wicked way with the city of Copenhagen. They were permitted to close off a lane of traffic on the major artery Åboulevarden and drive their car down the street. Here's the thing... there were over 100 extras on the payroll. Copenhageners on their bicycles. Including one guy who got $3000 to ride his BMX bike down some stairs. Not a bad rate. Apparently the storyline involves a C4 driving down the street and a growing flock of cyclists fall into line to follow it. Citröen wanted to show off their car in a large city with a massive level of cycling so Copenhagen was the obvious choice. Danish production house Moland did the filming. Simply, Citröen wanted to parade their car in a bicycle-friendly environment. Showing that their product can 'compete' with bicycles as transport. It's an interesting development. Sure, it's ridiculous - the car still pollutes and is still a killing machine that limits the development of liveable cities - but is this the car industry accepting the bicycle as an equal and worthy competitor? Okay... grain of salt. Haven't seen the finished product yet. But I'll be back when I do. My friend Andreas took this shot of the shooting of the advert last week. A camera rig on a Nihola cargo bike with an elderly chap riding it. No idea who the girl is on the left with her oh so Asian napkin on her mouth. An extra? You don't see those napkin-like masks here in Copenhagen except on the odd Asian tourist. Ironically, C4 is also the monogram of one of the most prolific and visionary Kings of Denmark, Christian the Fourth. Via: Various text messages, word of mouths and NPInvestor.